Destiny Duarte lost ten pounds after staying for three weeks inside the camp of The Biggest Loser Pinoy Edition. 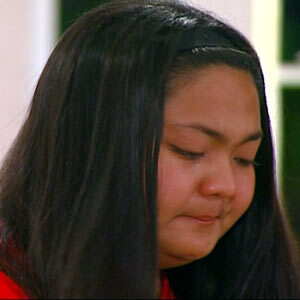 "Destiny Duarte of Red Team just lost her chance of becoming the very first Pinoy Biggest Loser after being voted out by four of her six teammates early this week. "Her elimination came on the heels of her team’s losing effort in the first competitive weigh-in of The Biggest Loser Pinoy Edition. "The Blue Team, composed of Alan, JM, Larry, Eric, Joy, Edden, and Angela achieved a higher percentage of weight loss compared to Destiny, Hazel, Winwin, Art, Raffy, Ryan, and Eboy of Red Team after three weeks of intensive training under Jim Saret and Chingay Andrada. "Blue Team also had the Biggest Loser of the first weigh-in in Larry, who lost 10.2 percent of his starting weight, going down to 229 from 255 pounds. The program chooses the Biggest Loser based on the percentage of weight loss and not on the actual number of pounds shed. "Destiny and Larry entered the camp at the same time, after winning in a twist early in the show, where they beat Leigh and Andy for the final two slots in the program. With the recent turn of events, the two are taking different paths now, with Larry still up for the title. "But all is not lost for Destiny as she can still win prizes just like the other contestants eliminated or to be eliminated in the show. At the finale of the reality show, the eliminated contestant with the highest percentage of weight loss will be awarded with P200,000 and a free 1-year membership at Fitness First. "Still, Destiny feels every bit a winner despite an early exit at the camp with many life lessons to take home with her. "I learned from Ms. Sharon that it is very important to love yourself. Derek, on the other hand, told us to always trust in ourselves that we can do anything. Chinggay and Jim also taught as about ABC—Act on it, Believe in it, Conquer it," she shared. "Meanwhile, the 13 remaining "bigating Pinoy" still have to fight for the grand prize, which includes a condo unit from DMCI Homes, P1 million, a Vespa scooter, a 40-inch Sony Bravia Internet TV, P100,000 worth of salon services from Artista Salon, and a lifetime membership in Fitness First. "After consecutive losses, can Chinggay will her team to a win against Jim’s Blue Team? Recently, viewers saw the Red Team’s trainer getting emotional after being frustrated by the performance of her team members. "Red Team even had an open forum where Art told Eboy what the rest of the group had in mind, and that is for the group’s resident joker to finally get serious about the training. Chinggay also scolded Raffy for not stepping up while his teammates are injured and for not training as hard when Chinggay is not around. "Will the remaining six Red Team members heed the call of Chinggay? Will Jim’s team loosen up after winning the challenges with game master Derek Ramsay and the weigh-in? Find out in The Biggest Loser Pinoy Edition with Megastar Sharon Cuneta on ABS-CBN’s Primetime Bida, after Minsan Lang Kita Iibigin on ABS-CBN."